Shoulder kielbasa strip steak, cupim flank pig meatball ball tip. Beef hamburger corned beef pastrami t-bone. I’ve been working and learning with Evolved Enterprise for over a year now. I’ll share my story with you in a moment. But first I believe I’ve pieced together a new way of selling that doesn’t involve “selling out”. It’s a better way to make more profits and create greater impact unlike what’s traditionally being taught and practiced. The fact is - it’s not your fault. If you look at most marketing courses or sales training materials, you’ve been taught that it’s all about “getting to yes”. It’s about conversion rates and optimization. It’s about maximizing revenue and transaction value. It all sounds more like some sort of military operation instead of a way to provide value and engage deeply with your prospects. We’ve been taught to use negative emotions….fear...scare tactics...and fake scarcity. Essentially whatever it takes to make the sale. To not feel like that cliche used car salesman with the slicked back comb over. Have you ever made the sale, but felt so dirty you needed to take a cold shower after? I did whenever I’d feel forced to put on “the act”. Go ahead, you can probably name a few more! On one hand, maybe you’ve rationalized to disconnect from what you know is truly right and maybe pushed the edges a bit. Your sales are good but you use somewhat questionable ways to influence and persuade your prospect. You still sleep pretty good at night knowing you’re delivering value but you wish you didn’t have to rely on “old school” ways to make profits. You realize you’re a bit out of alignment but you aren’t sure what to do about it. You cannot bring yourself to use any of the marketing “tactics” others might use. You really dislike the idea that you even have to sell. Why would you? You believe the value of your product or service will be immediately visible and people will just beat a path to your door. And you have such a big mission - you shouldn’t have to market. It’s not fair. You cannot understand why so many people ignore your emails or Facebook posts but you chalk it up to them not understanding. At the end of the day you’re frustrated and feeling financially strapped. Now the good news is these outdated tactics are working less and less. Your customers and prospects have become smarter than ever. They see right through traditional marketing. But today with the interconnectivity of the Web, the countless reviews, the increased power of information - it’s a different story. To me, it would be like looking through a high powered telescope first, before buying. And now everything I say isn’t taken seriously. The moon that looked really big and bright with our naked eyes - now all of a sudden you see every blemish, bump and meteor crater. You get the full picture. No wonder consumers have pretty much seen it all and become jaded in the process. All marketing speak, ad slogans and platitudes you use, are simply discarded. I mean look at the tools marketers have created for each other. Fake timer web scripts, one-time offer generators or “dominator” this and “killer” that. Is that really what we want? A bunch of ways to trick and manipulate our prospect into giving us money? There’s a new way...and we’ve called it “Evolved Expression”. But now it’s 2017… and those methods are like rusty gunked up car parts taking up space in your marketing mobile. Today’s most effective form of influence is speaking directly to your customer’s heart. We call it “A.T.V.”, which stands for Authenticity, Transparency, and Vulnerability. Authenticity — Keeping it REAL. Walking your talk. Have fun! Be true to yourself and your core purpose. Let go of who/how/what you think you’re “supposed to be,” and wholeheartedly embrace who you truly are. Be yourself, fully—originality in action. Transparency — Be open about your agenda. Make your intentions clear. Prove it through your actions. Going beyond the surface to share what’s deeper. Vulnerability — Transparency & authenticity both require vulnerability — the ability to be open to attack from all fronts in order to be seen fully by those who are meant to receive your message or truth. The more in touch you can be with your vulnerable self, the more universally your message will be received. You know when someone or a brand really uses this well. It’s the thought leader whose emails you read regularly and you can’t wait to see their Facebook updates. It’s the company that takes you behind the scenes and makes you feel like you are really part of something more. These are the guys that have A.T.V. down pat. Who Else Has Figured this Out? One of my favorite Evolved Enterprises, Patagonia, has been a stalwart example of ATV. 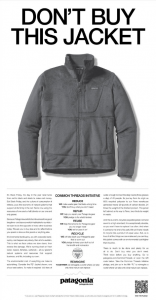 Here’s an ad they ran on Cyber Monday in 2011 that blatantly stated, “Don’t Buy This Jacket.” This ran totally counter to anything traditional marketing would tell you. This contributed to sales being up 40% for a two-year period following this ad. I doubt it’s just attributed to this campaign, but I think it’s a long-term mindset about the purpose of business. And this ad was said to be responsible for saving the store. Another ad written by Powers, for a different merchant, proclaimed, “We have a lot of rotten raincoats we want to get rid of.” This sold out the entire inventory of raincoats by the next morning. Talk about vulnerability, transparency and authenticity...he had it in spades...and it worked big time. A year and a half ago I didn’t know the first thing about marketing, but that didn’t stop me from applying and then becoming an apprentice with Yanik and the Evolved Enterprise team. I wanted to change the way business is played (and actually still do). My specific role during this apprenticeship was to grow with the copywriting program, dubbed “Evolved Copy”. I found myself surrounded by some of the top marketing minds around. Guys responsible for many multiple million dollar ventures, ideas and concepts... through the power of words alone. Let’s just say that I was a little intimidated to be presenting copy work to these guys! Luckily, each of them are humble people, so it’s been easy to absorb their unique strategies. During this in depth learning experience, I also spent a lot of time researching other copywriters and methods. We’re doing things differently here at Evolved Enterprise. (this stuff can work, but why use it if you feel in full alignment not doing it). Instead, the goal has always been to create a strong and authentic relationship based on trust, giving and support… and wouldn't you know it but it leads to more profits, impact, and fulfillment too! Now, if that sounds a bit like fluff to you, don’t worry. It actually works for nearly every business. Now the catch is, this “authentic messaging” doesn’t come naturally to most entrepreneurs... or copywriters… or people, for that matter. It’s kind of a learned skillset, just like playing the violin, and in today’s unresponsive world, it’s one of the most important ways to grow your audience and your business. Many of those who have mastered it are at the top of their respective industries and rising, as authenticity speaks directly to the heart, bypassing the brains BS filters and touching people where they actually feel it and are inspired. Well, Yanik finally caved in and agreed to help us lead the charge here and bring this course to life… . ...SO now, here we are, giving YOU the opportunity to get the same experience we’ve had. We’ve assembled an ALL STAR LEAGUE of eight marketing legends (and some surprise guests). The Evolved Marketing Alliance and I will be guiding you and supporting you every step of the way, taking your hand through an unmatched eight week course to enhance your digital (and in person) messaging via authentic human connection. You’ll not only grow as fast as other manipulative and “less ethical” companies, you’ll have the secrets to creating a truly authentic organization known for its trust. Why are all of these experts excited to come together and work with you? Because of what YOU represent. YOU are the impact driven entrepreneurs who can change this planet with your businesses. We NEED you to grow your businesses into formidable forces for good, so collectively we can actually stand a chance at improving this planet. The ripple effect here can be profound. It’s possible to reach previously unimaginable audiences. You’ve also never been bombarded with so much white noise… so many sponsored posts and ads hitting us left and right… from marketers and friends alike, wanting our attention. The number of advertising and marketing messages we are exposed to has grown exponentially. This has led to each of us developing our own fairly sophisticated B.S. meters. Honestly, I feel like I may have even inadvertently contributed to this “noise” at some point too by teaching copywriting and “Internet Marketing 1.0” ideas. A true way out to find your story and your message, and to uniquely craft your voice so it speaks directly to the HEART of your customers, so you’ll never ever have to feel even a little bit “off” by selling. I started as a copywriter...and I absolutely believe this is one of the skills that’s invaluable to learn. The art of copywriting gives you the ability to leverage and share an influential message beyond one-on-one communication. It’s scalable. Whether it’s a video, an email, an entire website - you can share the message with tens of thousands, even millions of people...perfectly. Many would say that I went all the way to the “top of the game," making millions and serving tens of thousands of happy customers. There was only one problem though…it was the wrong game! I knew I was moving in a good direction with my life and career, but there was still this nagging feeling that I just wasn't bringing my highest work to the world, that I was simply “going with what I knew worked” and doing the safe thing. But I heard that little whisper turn into a scream, a thought that kept leaking in, that I could do more, that I SHOULD do more. This program can help you align with that big change in your life. Let’s work together to change business as usual. Get the collective wisdom of 40+ years, A-Z BREAKDOWN, on marketing and copywriting. Everything from buyer psychology, to avatar design, to creating a “slippery slope” of interest...even down to perfecting your product name and the ideal word count of your pitches. Discover exactly what foundations to keep that still work in 2017 and which to chuck in the trash. The 100,000 foot overview on this new way to be AUTHENTIC, TRANSPARENT and VULNERABLE - designed to easily drive more profits, joy, and impact for the long haul. Sally believes the greatest value you can add is to become more of yourself. Because of this belief, she has created the Fascination Advantage®, the first personality assessment that measures how others perceive you - now taken by over 600,000 people. Get the complete breakdown of AUTHENTIC branding from two of the best in the industry, to FINALLY carve out your unique and profitable space in the market. Create a “true brand” with its own powerfully singular voice, to stand out in a crowd and to be easily identifiable by the right customers. Captivate your audience through fascination to double down on what makes you different because as Sally says, “Different is better than better”. Find out why building a professional, world-class brand beats the offer/launch/new offer mode and develops more trust with your ideal clients. Position your brand as THE market leader. Your Marketing Mentor: Lukas Resheske is a Marketing Research powerhouse and highly experienced teacher of copywriting who has been dubbed the “the copywriter millionaire’s recommend” by his clients. Find out this one SECRET and never be surprised again by the decisions your buyers make. Harness the power of ATV surveys to organize your audience for success. Gain THE INSIDER SECRETS he learned during his apprenticeship with the highly acclaimed marketing mogul and creator of the “Ask Method”, Ryan Levesque (Ryan is the guy who patented SurveyFunnel and was known for collecting over 52,000 new email addresses a day- leading to $120 Million Dollars in yearly revenue). Understand the little-used and little-understood deep mythological and archetypal sides to your customer that are hard-wired into our psyche from ancient times until today. Discover the esoteric art of Kylie’s process of “Soul Graphics”. This goes way beyond demographics and psychographics to tap into the core of what motivates your customer on a soul level. Unravel the “stories” that are in your customers heads, so you can connect to their narratives and find your business’s place in their lives. Be able to think exactly like your potential customers, and start noticing the small changes and tweaks that create big differences for higher profit, impact, and joy. Your Marketing Mentor: Patrick Combs - Patrick is a top-rated, widely known keynote speaker and thought leader on passion, possibility, and heart-based business. He’s shared stories and strategies from his journey with millions of people around the globe for almost 25 years. Get the simple step-by-step process that allows you to create "Hollywood blockbuster" stories for your sales message in minutes - even if you're not a writer, hate talking about yourself and feel about as creative as a broken #2 pencil. Learn how to tell your story in a totally impactful and unforgettable way to deeply connect with your audience’s heart every time. Discover tried-and-true methods to leverage the extraordinary power of personal stories for yourself and your company. Your Marketing Mentor: Chris Haddad - Legendary direct response copywriter you can’t hire at any price. He’s pretty much written for every subject. His copy has pulled over 9 figures in sales for markets ranging from language learning, to real estate investing, to natural health, to texting your ex back… and he wants you to know what messages work, so your businesses can create massive impact. Your Marketing Mentor: Mary Dee - Having recently helped one of her companies go from zero to $40 million in sales for its first year, Mary knows a thing or two about running a happy and thriving digital organization. She'll show you how to empathically communicate with your team, vendors, and clients, so you you’ll WANT to be TRANSPARENT about your company’s inner workings! Pour gasoline on the fire of your customer connections by learning how to feel for them on the deepest levels. Know how use THE TRUTH to tantalize and excite your buyers, so they continue coming back for more of your products and services. 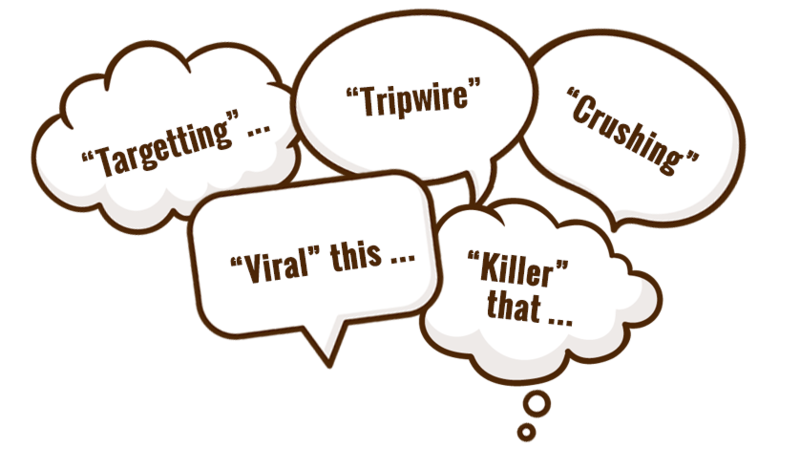 Finally find the right words to use from the start to get people to quickly engage your business, and actually evangelize your services to their peers! Your Marketing Mentor: Nate Rifkin- He went from loading boxes at a shipping company to becoming one of Agora Financial’s top copywriters. (This is a big deal because Agora is a 9-figure powerhouse in the direct response industry and they spend millions each year on copy alone.) Along with his powerful copywriting chops, he’ll give you the tools to reinvent your business and possibly even your life too. Understand how to best position your products, your services, and your mission, to reach greater profits, impact, and joy. Discover how to lock in your core offer, and compel your customers to SUPER GLUE it to the forefront of their minds. Your Marketing Mentors: Dmitriy Kozlov- Vision Tech Team and Influex CoFounder and Mike Budny - Conversion Specialist who helped spearhead growth to over $22 million in profits at a previous company. Revolutionize your own website and sales page, so that the authentic “soul” of your business shines through from the visitor’s first click until they seamlessly glide through to their final purchase. Understand how to optimize your webpages for higher conversions without relying on the over-the-top “tricks” and tactics others add to their pages. Learn the most cutting edge digital marketing strategies to give your authentic messages a perfect showcase online. Your own Evolved Email Marketing Campaign. While this course is offering you a full opportunity to raise your game holistically overall for selling, persuasion, and customer relationship building you’ll get one “secret weapon” that can quickly and easily get you 3x, 5x, or even 10x your investment. 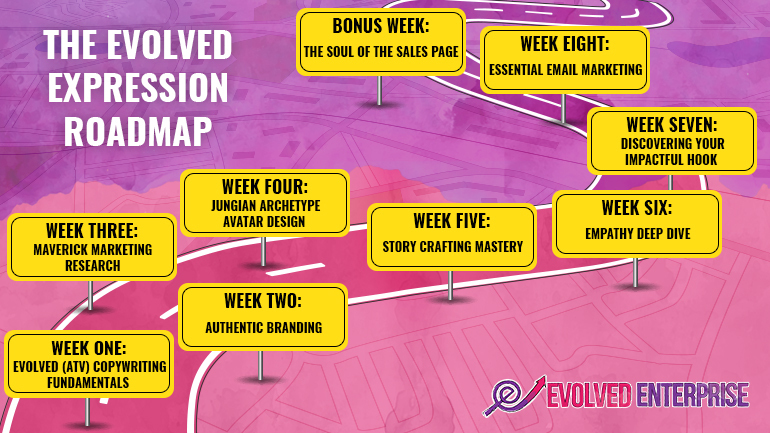 Together we will build out an Evolved Expression ATV Roadmap to co-create a powerful email sequence for your prospects or customers. The idea is to get immediate results so everything else you ever apply from the Evolved Expression sessions is icing on the cake. And you won’t be left alone to figure it out. You’ll get personalized critiques of your email sequence to ensure you are on the right track and it has everything you need to immediately show you a return by using the framework. (It’s hard to even put a value on this type of hands-on help). In other typical sales letters and marketing pieces, this is where we add up all the pieces and bonuses showing you the significant value you get and how buying now is such a bargain. As you might imagine, we’re not interested in “typical”. Hopefully by now you have a realization if this course material will be useful to you or not. And whatever value we assign would be arbitrary so let’s not even go there. Your investment is just $695. That might sound like a little or a lot. Hopefully a little if you factor in and consider how important this is to the overall business. How you use marketing, sales, stories, positioning, branding, etc. for just about each piece of your company. A little if you consider each of these experts, if you could even get them, typically charge more than this for 1-2 hours of consulting. And a small fraction of the value if you finish the Capstone Evolved Email marketing campaign bonus with us. The information in this course is quite powerful. It can be used to help A LOT of people… but it can also be dangerous in the wrong hands. Please… only sign up for this program if you are willing to step up your game, put in the work, and use this power for good. I will use these marketing techniques for good. My business will be a lighthouse for others. I will honestly and ethically present my products and services to prospects and customers. I will honor each assignment that my Evolved Marketing Mentors Ask of Me. A percentage of the profits that I make from this enterprise will go towards causes that positively impact the world. One admission is this course is new (there are no testimonials or success stories we can show you yet). And it’s an experiment so that means we have no idea if we’ll teach this again. Well, we honestly don't know if we'll have enough students to make this viable or even if we are going to be able to find the right students who really believe in the Evolved Enterprise concepts and want to actually use these ideas to make a bigger impact. The plus side is you’re probably going to get even more help and attention because we’re dedicated to making sure you get a 10x return on your investment. Not only from bringing in the top marketing minds for you to learn from but also by making sure we over-deliver on the personalized critiques and truly assists to really fuel the fire for your mission and your impact. We want you to become an “Evolved Marketing Hero” for your team and your customers by the end of this program. Think of the movie, The Matrix, where Neo has to make a decision. Right now you’re at that spot. Do you take the red pill, or the blue? Turn left, and everything stays the same. Uncomfortable or feeling a bit “off” when you’re selling -- it means you’re NOT truly fulfilling your greatest work. That means your will suffer because of this lack of alignment. 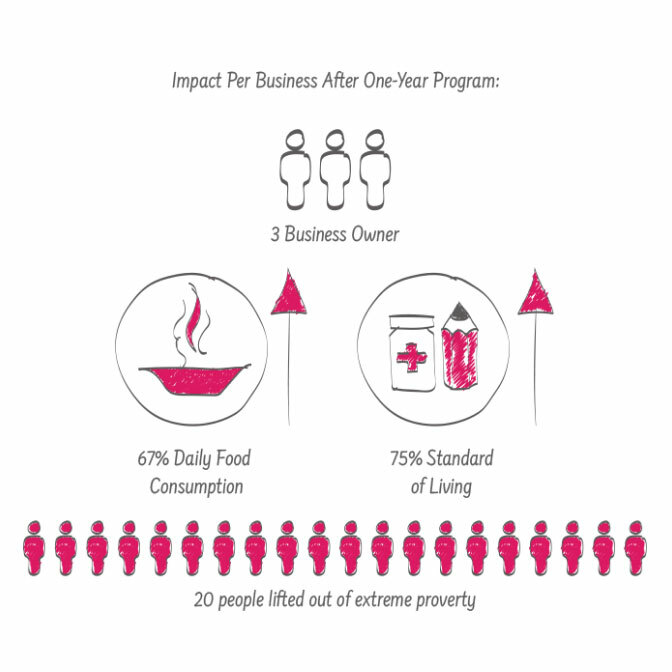 Not only just diminishing your bottom line, but also dimming the impact you can have in the world. If you feel like you have a greater gift to share and you want to get it out in a bigger way - Evolved Expression will empower you to craft the ultimate message for who you are and what you stand for. Come on this journey and let us give you the POWER to move your VOICE toward the results that you REALLY want. The old way of thinking was to position ourselves as the all-knowing and all-powerful experts. We could control the narrative and spin. But today, your consumer wants and expects to go “behind the curtain” with you. Fear is a good thing here… because it can lead you to courage. Think about this. Your most captivating stories are generally the ones hardest for you to share… they pull off your mask… they take away your protection. That’s where the vulnerability lies, and until you take yourself to that revealing place you’ll never get the raving fans you could. Now there is a balance though. The expression “TMI” - too much information applies here because there is a line that is inappropriate to cross. You’ll get the guardrails in the lessons. So you failed English class? No problem. This course is designed for all levels, from the novice to the experienced copywriters. The lessons share greatly enhance your ability to write to compel, but more importantly, we will show you how to connect deeply with your audience. Evolved Expression will teach you how to be your authentic self and get rewarded for doing exactly that. You may already know that copywriting is by far the highest paid profession for any writer, and at the same time, nearly every business has a need for this powerful skill. For those of you with experience copywriting… it's pretty much guaranteed you've been ethically challenged by the “shady” elements of selling and persuasion. This program gives you the revolutionary tools to craft the most effective and authentic “voices” for your products, and to infuse your messages with heart, trust, and effectiveness. Yes and no. There’s wasted time and there’s invested time. You should still commit to a minimum of 1 and ½ hours to 3 hours each week to get the absolute most out of this masterclass. Also, keep in mind that the more time you spend on your homework action steps, the more growth you’ll see. Yes. Most entrepreneurs have super tight schedules, so we understand you might not be able to catch all these sessions live. Once you join the program, you’ll gain access to the vault of previously live mentoring sessions. You can go back to these recordings at any time and/or share them with your team as well.